Whether you’ve been patiently waiting to purchase a new car or you have your heart set on a pre-owned luxury model, Baxter Auto Group makes it easy to save with Black Friday sales. 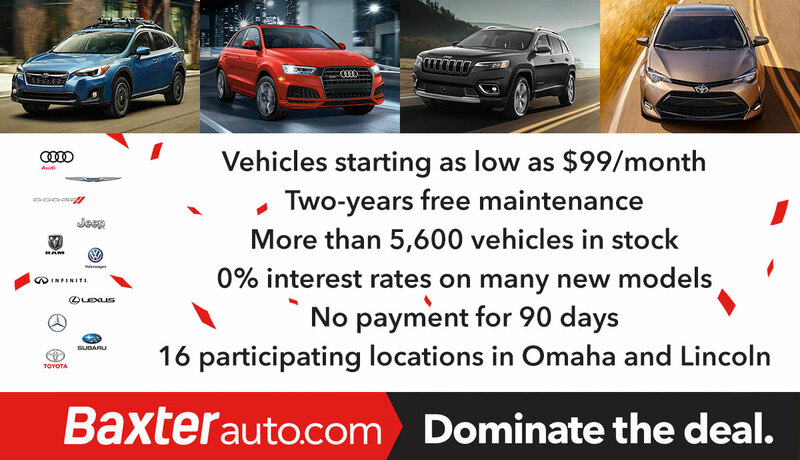 Available at 16 participating locations in Omaha, NE, and Lincoln, NE, our Nebraska car dealerships have exciting vehicles on sale, including everything from new Honda sedans and new Ram trucks to used Subaru crossovers and pre-owned Lexus SUVs. Our Black Friday sales end on November 30, so stop in at one of our local car dealerships this month. Save on leases starting as low as $99 per month or ask about how you can enjoy two years of free maintenance. With 0% interest on many new models along with $0 payment opportunities in your first 90 days of ownership, what’s not to love? Plus, with over 5,600 vehicles in stock, your options are endless! As the winner of Omaha Magazine’s Best of Omaha Best New Luxury Car Dealer, Best Used Luxury Car Dealer, Best New Car Dealer and Best Used Car Dealer, it’s clear that Baxter Auto has its customers’ interests at heart. Contact Baxter Auto or stop in at one of our 16 participating locations before these Black Friday sales end to save big!